This cake is the reason I bought this book. I have never had nor have I ever baked a Red Velvet cake but boy do I want to photograph one! They really are one of the most photogenic cakes I have seen on the internet. I figured a book full of southern cakes would have the most authentic recipe. 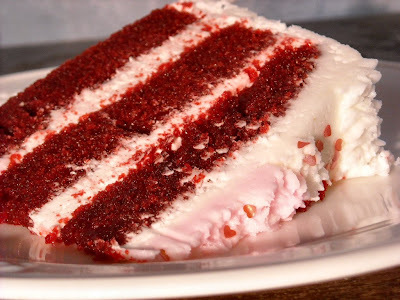 Since I have never had Red Velvet I don't really know how this one compares so be sure to check out the rest of the Cake Slice Bakers and see their reviews. My only hesitation with the cake is the fact that it calls for a whole bottle of red food coloring. I did find a reference to a very early recipe that says beets were used to get the red color. I enjoyed the cake. I rarely meet a cake I don't enjoy. The real test for me is how many slices will I gobble up before I realize I have a problem and call a friend to remove it from my house. I only had one slice of this cake and I did not call for it's removal. 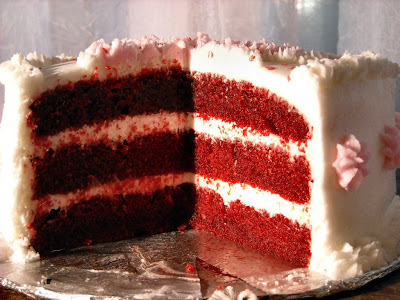 Do you have a favorite recipe for Red Velvet Cake? On the plus side I had a great time decorating this cake. The edible red heart glitter is so much fun! When I first started baking along with the cake slice bakers I used to dread decorating my cakes. Now it is my favorite part! Fabulous! It looks wonderful! I don't come to your site if I'm hungry, I just want to snog down your goodies and then have a total letdown as it is just a picture! I would like to learn how to bake bread! I grew up on a farm and my mom made bread once a week (the old fashioned hand kneading way) so I would really say I DO know how to do it, I just need to start! Not sure I want to do all that kneading though! I have a Kitchen Aid, do you think that will handle one loaf OK with the bread hook attachement, or will it burn out the motor? Let me know if you have any experience with this! This is by far the prettiest cake ever! Yours turned out beautifully! I really hope my oven gets fixed soon, because I need to taste the finished product. Your cake looks great! Very professional! Your cake looks so yummy! Now I wish I wouldn't have done cupcakes! Gorgeous pics! I did have a favorite red velvet recipe, but I think this one dethroned it! Yours looks wonderful! Your cake is so pretty and girly. I've made about 4 different recipes for RVcake and this by far was my favorite. I can see your photography at work. Your cake is beautiful! I adore red velvet. I'm still searching for the perfect version for me! As for your comment on my blog, you can find chia seeds in a health store (for example Whole Foods). 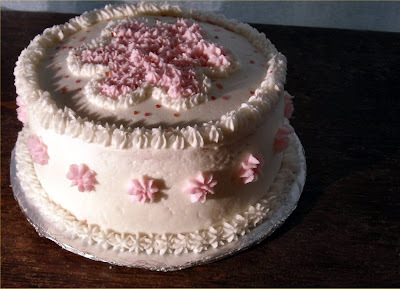 Your cake looks so pretty and girly. The layers in your picture make it look desirable to eat. I hope you didn't eat too much of it.